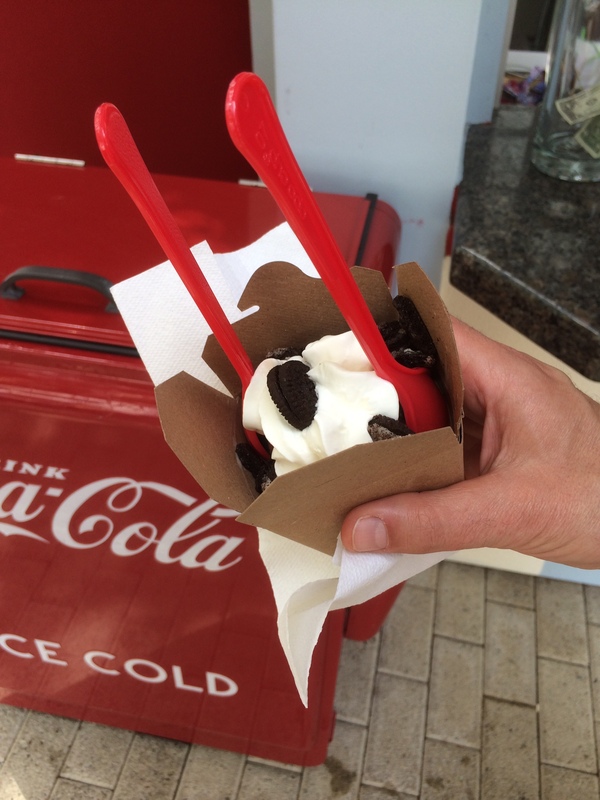 If you are heading to National Harbor to enjoy some of the great activities like the Capital Wheel, do some shopping or dining at the restaurants, make sure that you stop at Goodies Frozen Custard & Treats. 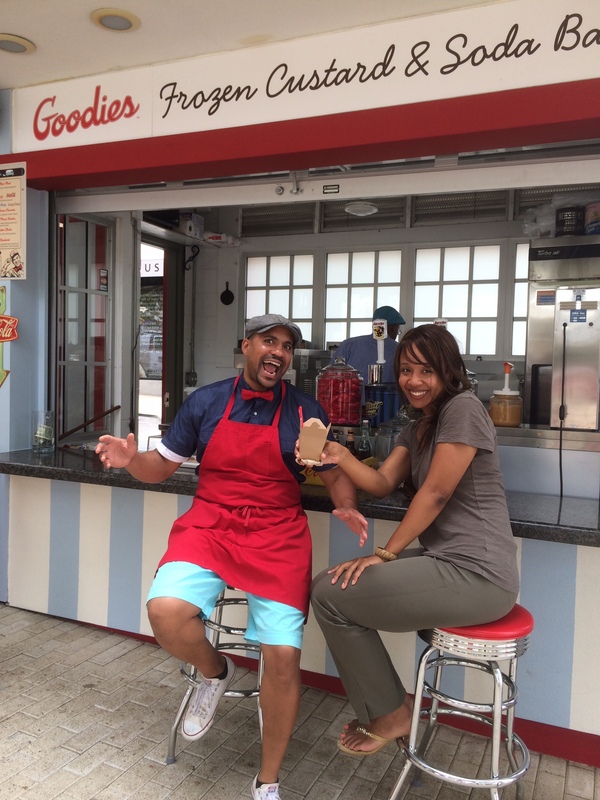 Goodies is located in the middle of all the action at the Harbor. You can’t help but smile and be put in a good mood when you walk up to their stand. The 50’s inspired decor takes you back to the old soda shops and you start bopping to the great 50’s tunes being played on the speakers while you wait to order your sweet treat. They serve frozen custard that is, in one word, amazing! It is the best I have had locally in the DC area! The vanilla bean is very prominent and the flavor explodes in your mouth. It is rich and creamy. Goodies takes the vanilla custard and makes floats, concretes and shakes with a variety of items to mix in. If you are in the mood for a sweet indulgence and if you dare, try one of their special treats; the sweet custard sandwiched between their homemade donuts. Below is the ‘Big Red’ donut sandwich. Red Velvet cake glazed donut with the sweet custard, drizzled with dark chocolate. It is definitely worth every calorie! 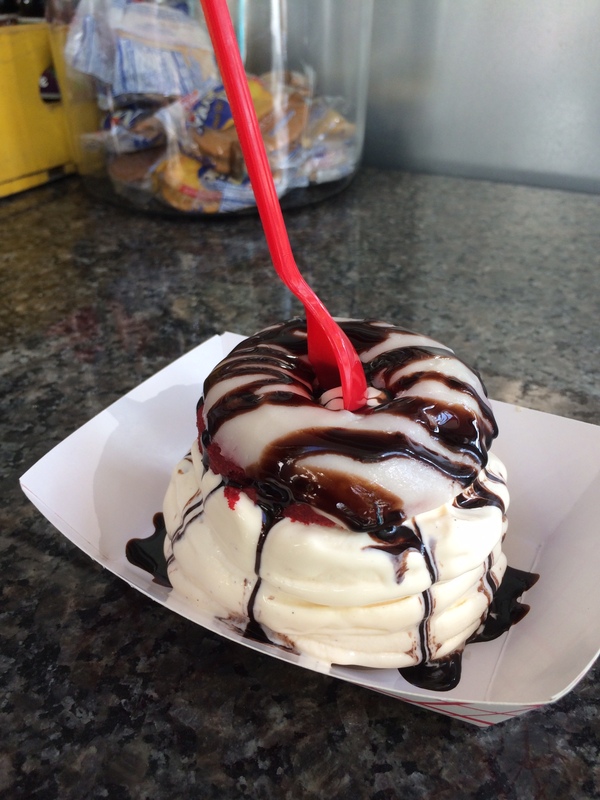 Big Red Donut Sandwich; Red Velvet Cake donut, sweet vanilla custard drizzled with dark chocolate. It is great when you eat something and it instantly transports you back to your childhood. Tasting Goodies custard, takes me back to memories when my parents use to treat me on a hot summer evening to get frozen custard. We would sit on the curb and licking our cones. When something takes you back to a cherished memory, you know that is a good bite! Make sure that you say ‘hi” to Brandon, who is usually behind the counter making the sweet treats and dresses very snazzy. He definitely adds to the fun of being at Goodies. Follow them on Twitter and like them on Facebook.